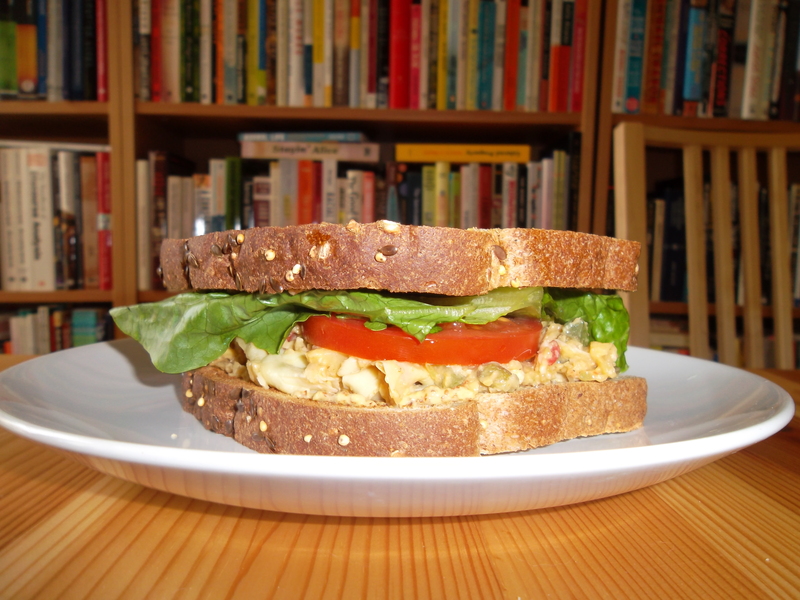 As a vegetarian, one of the things I miss is chicken salad sandwiches. Not the chicken part, but the salad-on-a-sandwich part. Not too long ago, I found this recipe in an issue of Vegetarian Times, and it’s been a part of the regular rotation in our kitchen ever since. It’s a pretty reliable no-chicken chicken salad recipe, but since the main ingredients are chickpeas and artichokes, we like to call it the “chick n’ choke” salad. This salad is a breeze to make. Use your food processor to mix up some chickpeas, artichoke hearts, Dijon mustard, Old Bay seasoning, a little bit of vegan mayo, and a few small handfuls of this and that. You’ll end up with a chunky salad that is easily spreadable on bread or crackers. I am particularly partial to this salad on slices of pumpernickel or rye with crunchy lettuce and a slice of tomato. But I only had regular multi-grain bread on hand when I made this the other day, and that works, too. Another way we love to eat this is with crackers. We used to always eat it with Ritz, but I am really enjoying this salad with those new nut thin crackers from Blue Diamond. Give those a try! This is a perfect recipe to add to your repertoire of hot weather meal ideas. Chick n’ choke salad makes a great cold dinner, when it’s just too warm to spend more than ten minutes in the kitchen. Make it up the night before, let it chill in the fridge overnight, and eat it the next day for lunch, snacks, dinner, or all three. There are a lot of ingredients for this salad, but each one adds important flavor, so my advice is to not skip anything. 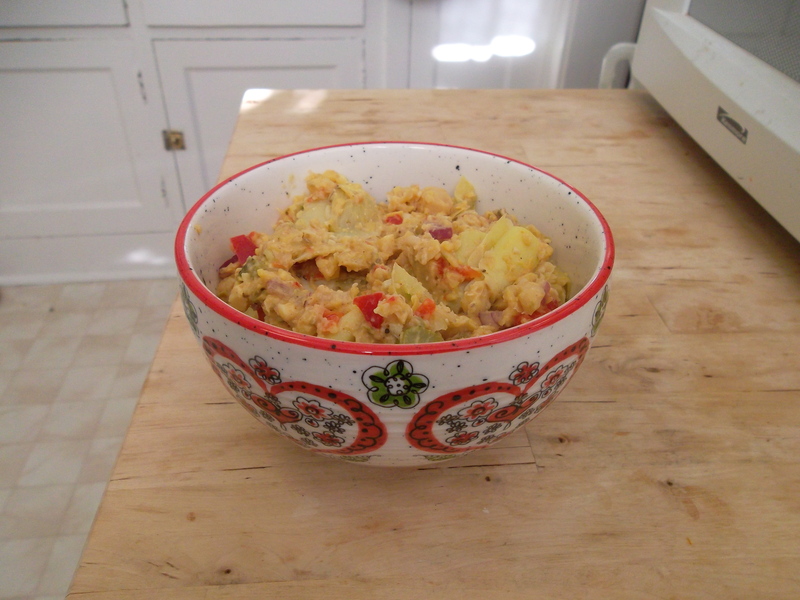 Use any kind of onion you have on hand, and swap the red pepper for a green bell pepper, if you want. I always use vegan mayo for this, so I don’t know if there would be a taste difference with regular mayo. Put all ingredients in a food processor and pulse until chunky, or whatever consistency looks good to you. I like it on the chunkier side. Transfer to a bowl, season with salt and pepper (this part is important! ), and chill for at least an hour before you eat it. You have to let the flavors mingle and marry. I like to make this up at night, let it chill overnight, and then eat it the next day. Categories: artichokes, chickpeas, easy, salad, vegan | Tags: artichokes, chickpeas, salad, vegan | Permalink. I make lots of different pastas. Some preparations are in regular rotation throughout the years (the pasta w/ chickpeas + garlic sauce is a particularly good one – we’ll get to that in another post). Others become weekly fixtures for a few months and then, well, just sort of disappear. I still hang on to those old recipes. They remain scotch-taped into my little spiral kitchen notebook, and sometimes, when I’m really out of ideas, I declare a plan to unearth one and recreate it. But lately, those new-again pastas have been really disappointing. Maybe my tastes have changed, maybe I forgot the small changes I used to make to the original recipe, or maybe the dish was never as tasty as I remember it. I should probably take these old recipes out of the notebook, but I like to leave them there, like little souvenirs or old snapshots of my past. My kitchen notebook is like a scrapbook, in that way. But a few months ago, I was searching online for recipe inspiration, and came across this. 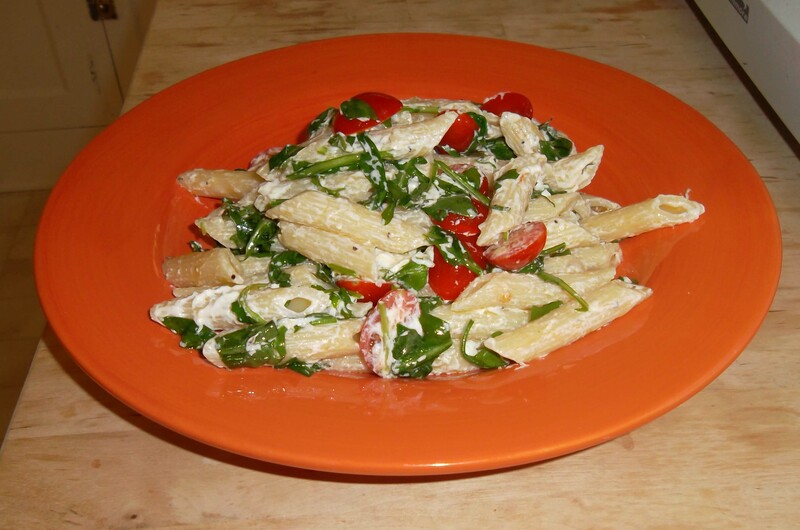 It’s penne w/ a very simple “sauce” of goat cheese, arugula, and tomatoes. It’s delicious, and has quickly become our new favorite pasta, for right now. The method couldn’t be easier. In the time it takes to boil the water and cook the pasta, you chop everything up and throw it in your largest mixing bowl. Add the drained pasta, toss, and eat. We’ve made this a couple of times now since its discovery, and it definitely feels like a keeper. I love having a new favorite pasta recipe, don’t you? I don’t know if this one will slowly fade away over time, like the others, or keep its place front and center in the rotation. Either way, it’s good right now, on these early summer days, in our kitchen. I hope you enjoy this pasta. I think it would make an excellent dish to share with others. The flavor combination is really good, and you can easily have a drink and chat with guests while you boil and chop, pulling it all together. I suspect it would also go really well with a green salad dressed with a lemon-y vinaigrette. I first found it on Dominick’s website here, but it’s also featured on allrecipes.com. You could probably substitute spinach for the arugula, but the arugula does give it a nice pepper-y bite. Feel free to use whatever size/shape tomato you’d like, too. The recipe calls for 5 ½ ounces of goat cheese, which means you have to buy two of those little 4 oz. logs. On days when I’m feeling really broke, I just use 4 oz of goat cheese with the same amount of pasta and other ingredients, and honestly, there’s not much of a difference. You can do that, too, if you want to save some pennies (and calories) sometimes. But for the first time, you should make it using the entire amount of cheese, to get the full effect. Boil water and cook the pasta according to package directions (until al dente). In the meantime, prepare the other ingredients and place them in the largest mixing bowl you have. Drain the pasta and toss with the other ingredients. You’re done, now eat! Categories: arugula, easy, goat cheese, pasta | Tags: arugula, goat cheese, pasta | Permalink. I’ve been wondering how to start this blog. I’ve been thinking about the perfect way to say hello, invite you to come on in, grab a seat, make yourself at home. So I figured, why not start with a snack? And maybe some tea. You should have some tea, too. We eat a lot of granola bars around here. They are the perfect little thing to have tucked away in work/gym/school bags. Store-bought ones are okay, but homemade has to be better, right? When cooled completely, slice them up into bars, squares, whatever you’d like. The full recipe follows. Hope you enjoy these. And I hope you enjoy this blog, too. I pretty much followed the ingredient list and the steps outlined in the original recipes. I omitted the coconut, only used 1/3 cup sugar (they are plenty sweet), and I only had salted butter on hand, so I just decreased the amount of added salt. I also used regular semi-sweet chocolate chips and thought they worked just fine. I think this is one of those recipes where better quality ingredients will yield yummier results, but honestly, what you probably already have in your cupboard is just fine. Preheat the oven to 350°F. Spray an 8-inch square baking pan with cooking spray. 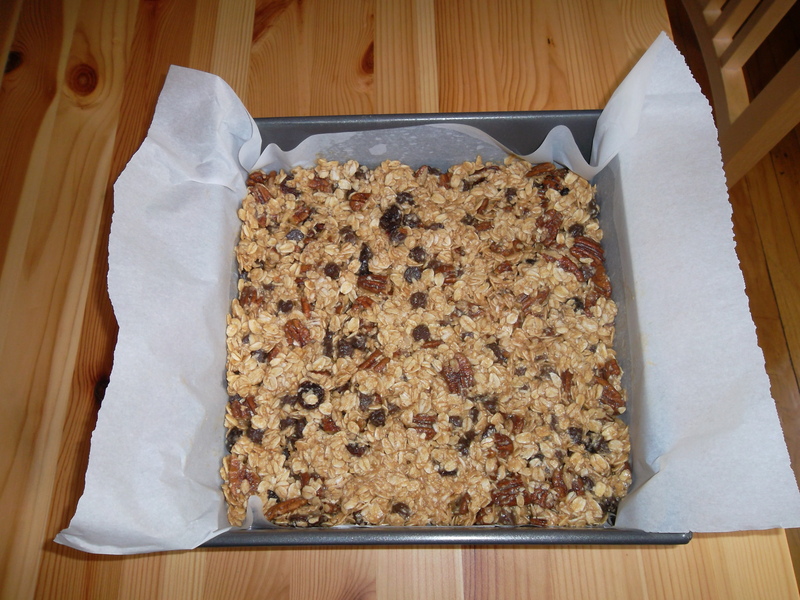 Then, line it with parchment paper, leaving a little overhang so you can easily take the bars out of the pan. Lightly spray the parchment paper. Put 1/3 cup of the quick-cooking oats in a food processor and process until finely ground. Then, in a large bowl, stir together the remaining 1 2/3 cup oats, ground oats, sugar, pecans, chocolate chips, dried cherries, salt, and cinnamon. In another bowl, whisk together the peanut butter, vanilla extract, melted butter, honey, and water. Pour the wet ingredients into the dry ingredients and stir well. Transfer to the prepared pan. Now, you want to press it down. I took Molly’s advice and used plastic wrap to do this. Bake the bars for about 30 minutes, or until they’re brown around the edges and just beginning to color on top, too. Mine didn’t really noticeably color on top after 30 minutes, but it did get darker around the edges. And it’s true, it will seem underbaked if you press down in the middle, but that’s okay. Let the pan completely cook on a rack. I let mine cool for a couple of hours. Then, lift them out of the pan and cut ‘em up! 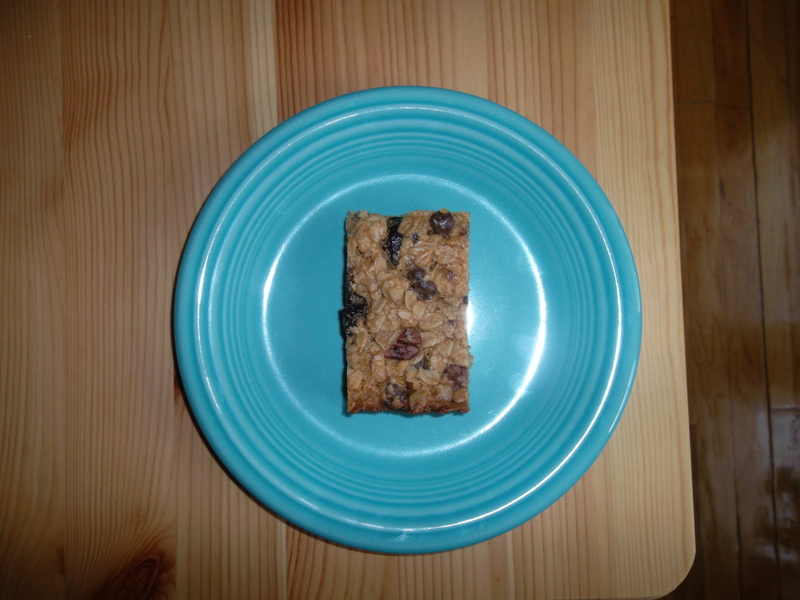 Categories: Baking, granola, snacks | Tags: baking, granola bars | Permalink.